Part P - what does it mean? It refers to Part P of the building regulations for England and Wales. Part P gives legally enforcible rules relating to electical safety in domestic premises. 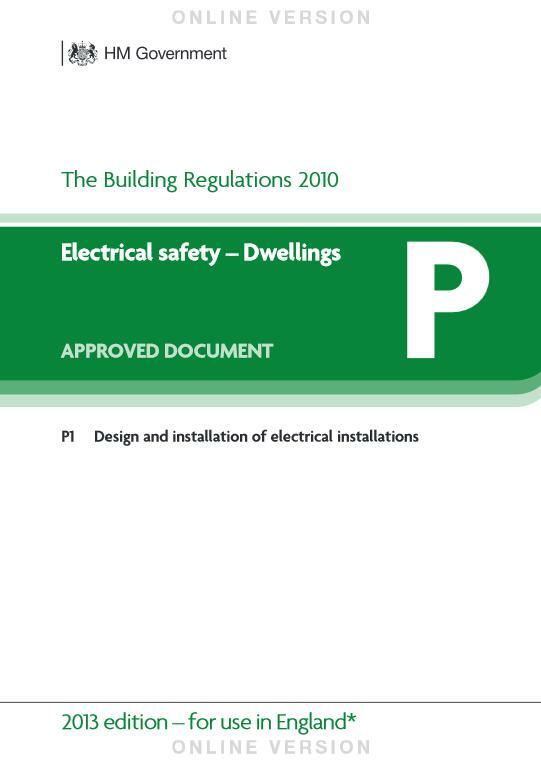 Since it's introduction in 2005, all electrical installation work in dwellings in England and Wales must comply with Part P of the building regulations. It was introduced to help reduce the number of injuries, deaths and fires caused by faulty electrical installations and to make it more difficult for so called cowboy builders to leave electrical installations in an unsafe condition. Needless to say, JMC Electrical Services are fully Part P accredited with NAPIT (see below). We are assessed annually and provide full certification with all electrical installation work carried out. For more information about Part P and why it exists to protect the customer, please refer to the Electrical Safety First website. To view the full PDF Part P document, click on the image to the left. NAPIT - National Association of Professional Inspectors and Testers. NAPIT is an organisation committed to consumer safety in the Domestic, Commercial and Industrial sectors. The whole aim of the organisation is to ensure that through the competence of members, consumers can be confident of work that complies with the relevant regulations. NAPIT operate a comprehensive and rigorous code of practice for all members, but simply abiding by the rules and meeting the regulations is not the end of the story. A job can be safe, comply with regulations and still be poorly done, which is why NAPIT offer a Work Quality Guarantee scheme to give you peace of mind; details of which appear on the Compliance Certificate issued by NAPIT on behalf of members when the work has been completed. JMC Electrical Services, your local Shrewsbury electricians, are registered members of NAPIT.